Pushcarts, and kiosks have been around since biblical times, if not longer. From wooden wheeled structures to dimly lit-stalls lining the unpaved streets of a medieval town; wherever people have congregated, there has been an opportunity for specialty retail merchants. The thirteenth century painting below shows a French marketplace. It’s not hard to imagine that in such a place, one could find food and refreshment, sundries required for everyday life, hear the local town news, visit with neighbors, and even enjoy a performance of minstrels and acrobats. Fast forward to 1966. Benjamin Thompson, Professor of Architecture at Harvard University and member of the transformative Architect’s Collaborative, whose membership also included the icon of Bauhaus, Walter Gropius, published his 1966 essay, “Visual Squalor and Social Disorder.” Thompson advocated for urban architecture that would encourage, rather than discourage, joy and social life.To this end, in 1967 he proposed reviving Boston’s historic markets with food stalls, cafes, restaurants, and pushcarts. Was he looking at the thirteenth century French market place when he thought of this? Thompson’s advocacy was ultimately realized through his collaboration with James Rouse, of The Rouse Company. 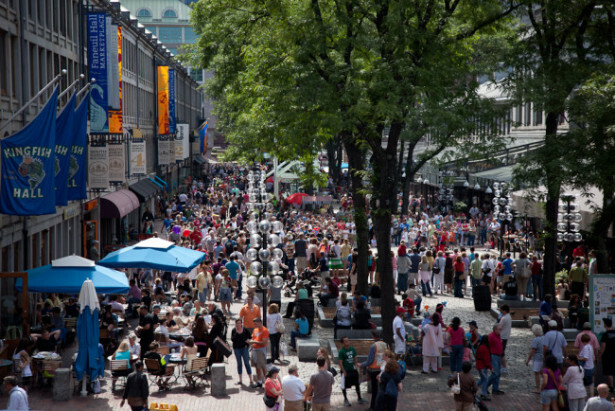 It was brought to life when, in 1977, they renovated Faneuil Hall, the first American Festival Marketplace. About Faneuil Hall, aka Quincy Market, Chan Krieger of the Harvard Graduate School of design writes, “Still, although the activities of shopping, dining, and people watching (not to mention juggler- and clown-watching) are commonplace, the place itself remains, well, distinctive, special, venerable.” The images above and below suggest that Thompson and Rouse took a lesson from the past. Although festival markets are now passé in the developer world, they’ve left an indelible mark on the specialty retail industry that will never be erased. The progenitors of festival markets sought to effect urban renewal and renovation. The approach was to place projects on landmarks with deep historical significance. Did they anticipate the symbiotic relationship between the gregarious, informal atmosphere of the festival market, the merchants, and their customers? It is hard to believe that they didn’t. Faneuil Hall, the first festival marketplace, was considered to be a high risk development project at the time of its inception. Some reports suggest that in its first year of operation, Faneuil Hall attracted nearly 15,000,000 people virtually doubling the number of tourists visiting Boston that year. Nowadays, virtually every common area program incorporates lessons learned from this experiment in renovation. The logic is obvious; create an attractive retail venue with gathering areas for recreation, using architecture that ties local history and culture to its inhabitants. 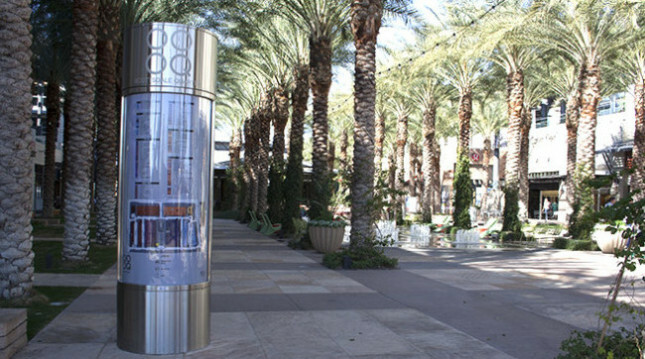 Shown below is the common area of the Scottsdale Quarter in Scottsdale, AZ (a Glimcher property). The first photo, taken in the evening, clearly demonstrates the integration of retail with community. Little imagination is required to connect the medieval market, and Thompson’s renovated Faneuil Hall to the modern day common area with merchants, food purveyors, and shoppers.